Before tonight's performance ( Tchaikovsky's 4th) we were allowed into the RAH early to visit the restaurant. Its a great way to start off a visit to the proms - though remember to book in as soon as you get your tickets as there's only one sitting and the restaurants sell out quickly . 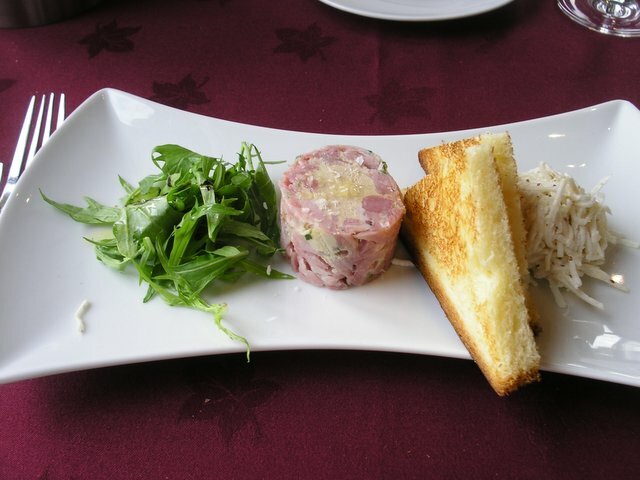 I ordered - Ham Hock and Foie Gras Roulade, Mustard Seed and Celeriac Slaw with Toasted Brioche. Excellent, just the right saltiness in the Ham and not overpowering the Foie Gras , the celeriac slaw was a great crisp accompaniment to this. 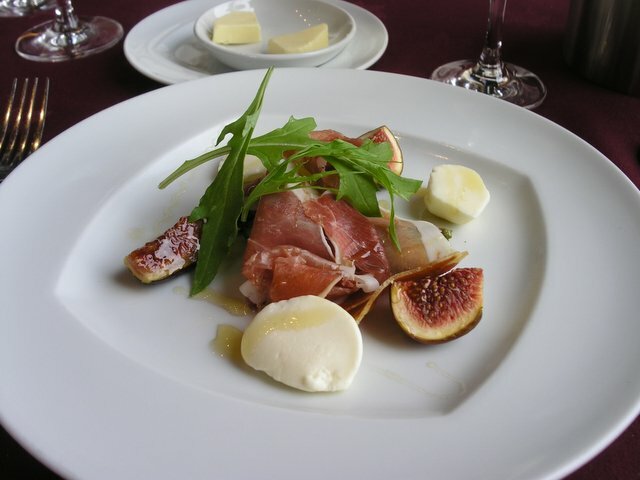 The cheese stood out for her as did the figs, by the way in case you're wondering the asparagus is hidden under the Parma. All the ingredients lovely and fresh. A minor criticism however is the leaf on top was rocket; it was rather tasteless lacking that peppery kick . 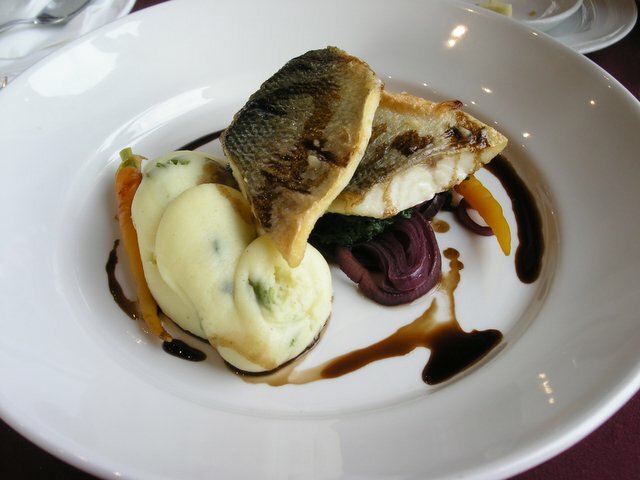 Jack chose one of her favourite fish as her main course above Roast Fillet of Sea Bass , Red Wine and Blackcurrent Shallots , Spinach, Spring Onion Mash. Nicely done with good flavour, simple but very tasty. 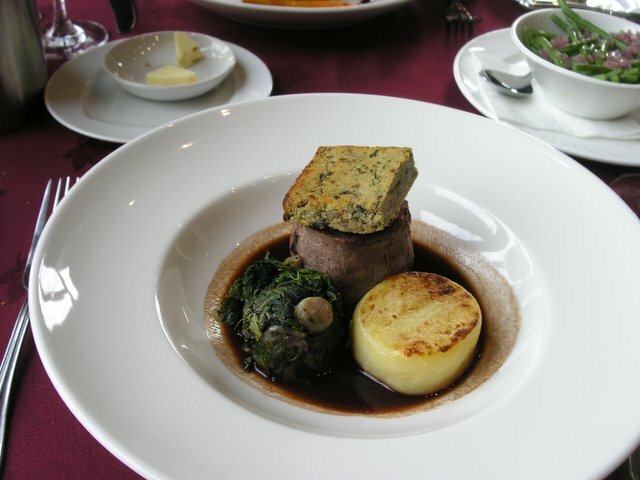 I chose the Pan Fried Fillet of Beef with Wild Mushroom Crust, Fondant Potato and Red wine sauce. An excellent piece of beef cooked slightly more medium than I would have liked though the plate was so hot it probably left the kitchen rare as I asked for it and probably carried on cooking. Good strong tasting sauce; again a very simple dish relying on a good flavoured piece of beef. J finished off with a Gooseberry crumble and I had a Vanilla Pannacotta with Raspberry broth.